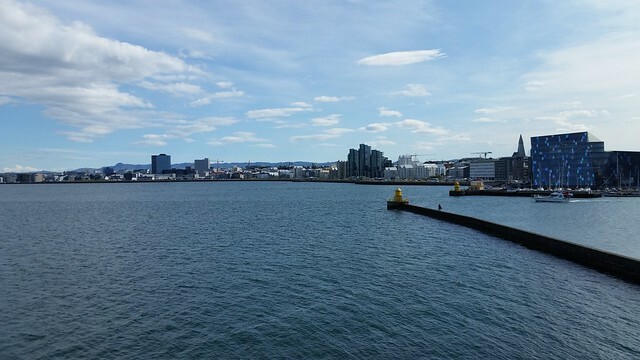 Today was an unstructured day exploring Reykjavik. We had no idea what we would find. Probably the most colorful find of the day was Kumiko, a Japanese-themed tea house designed by artist Sara Hochuli. I was so taken by the artwork that I was going to go in and give them kr100 just for admiring it, but we decided to have a pot of tea, and it was kr850 well spent. But I'm getting ahead of myself (and I wanted to lead with this part of the story because anything quoting this story uses the first photo as the preview). 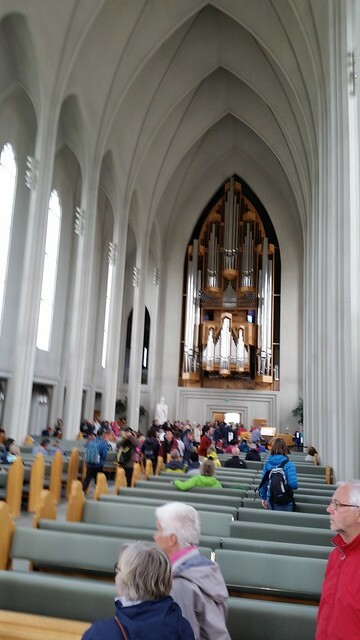 When we left the hotel, the queue to get into Hallgrímskirkja was short, so we decided to have a look inside. The building is as impressive from the inside as from the outside. 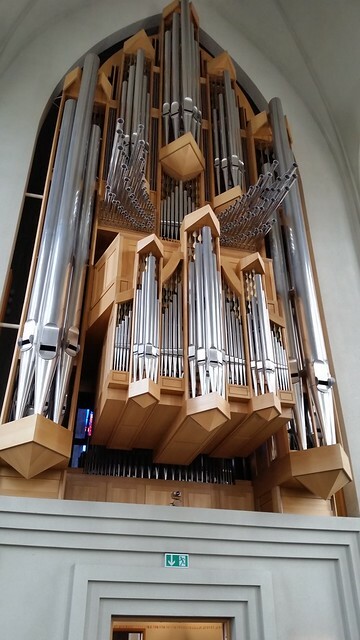 The soaring nave is dominated by this massive organ. 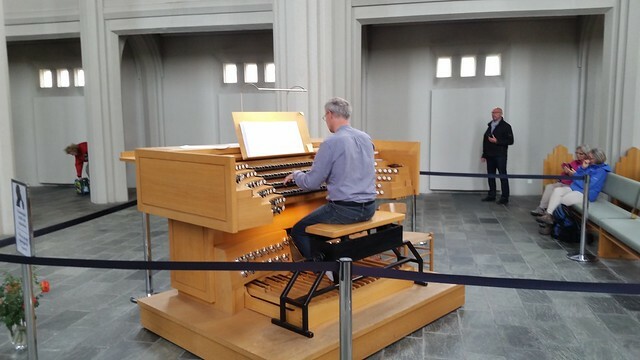 We were fortunate that there was an organist playing when we visited. The acoustics are astounding. I was impressed. Lisa was in awe, even more so than in some of the other religious buildings we have visited such as the Mormon Tabernacle in Salt Lake City, Westminster Abbey, or Kōtoku-in (site of the Giant Buddha) in Japan. We made a contribution toward the fund that pays for the cleaning and maintenance of the more than 5,000 pipes in the great organ. The queue for the lift to the top of the tower was too much for us, however, and we left to see more of the city. We bought a ticket for the "Hop On/Hop Off" bus tour that circles the city. It was helpful that they would take payment in Euros, because it helped us use some of the leftover currency from Finland. Partway around the loop we saw this building, which is Höfði House, site of the 1986 Reagan-Gorbachev Summit. 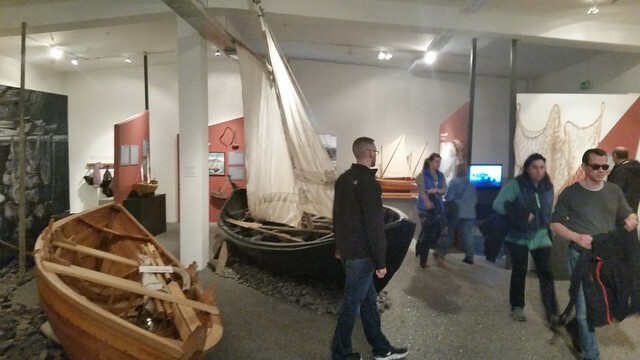 At the Old Harbor, we hopped off and visited the Vikin Maritime Museum of Icelandic fishing history. There we learned about the Cod Wars between Iceland and the UK over fishing rights in waters claimed by Iceland. 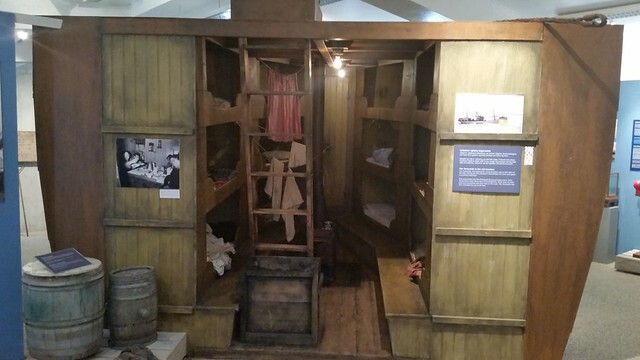 I know I complained about our hotel room at the Leiur Ericsson Hotel, but it's not quite as cramped as this recreation of crew quarters on an Icelandic fishing trawler. 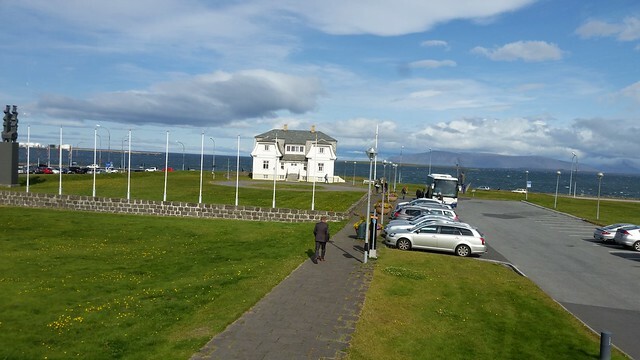 After the museum, it was time for lunch, and near the museum we found Sjavárbarinn offering an all-you-can-eat seafood lunch buffet for what appeared to be a fairly reasonable price (at least by Reykjavik standards). We made the most of this buffet, and both Lisa and I liked it. The fish cakes were not (despite the claim on the menu) as good as those my grandmother made, but I don't think that's actually possible. Otherwise, the rest of the buffet exceeded my expectations. From across the Old Harbor we saw the large green mound near one of the two jetties protecting the harbor, and after lunch we walked out to have a closer look. We needed that walk anyway after all of that food. The mound is, I find, called Þúfa (Thufa), and there is a narrow path that wraps around it to make for a fairly easy climb to the top. (But there's no guard rail, and I found myself leaning into the hill as I climbed the eight-meter high mound). 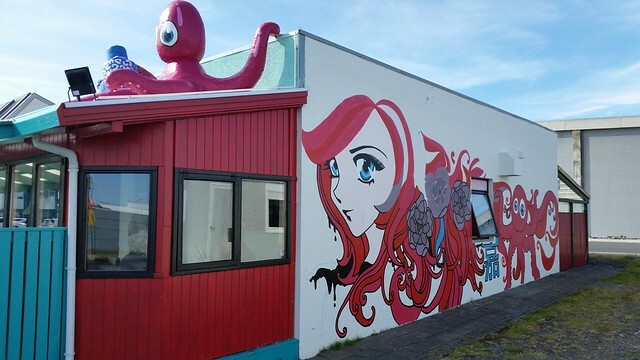 At the top is a wooden fish drying shed full of drying fish and some wonderful views of Reykjavik. Click through the photo above (as usual) to see the others. I found the climb down harder than the climb up. I kept thinking about what a fall down the hill would do to me, and once I got beyond the point where I thought I'd break a leg at least if I tripped, I felt much better. On the way back from the Mound, we stopped at Kumiko for a pot of tea and to admire how the place is decorated. After our morning and early afternoon exploration, we got back on the bus. Joining us at that point were a German family heading back to the cruise ship we had seen earlier in the day. Lisa hit it off with them right away. 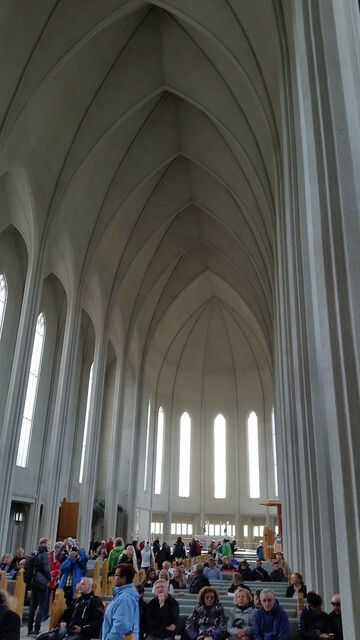 We rode back to Hallgrímskirkja, bade the Germans bon voyage, and went back to the hotel for a break and a cup of tea for me and hot chocolate for Lisa in the hotel common room before making another walk downtown to explore more. 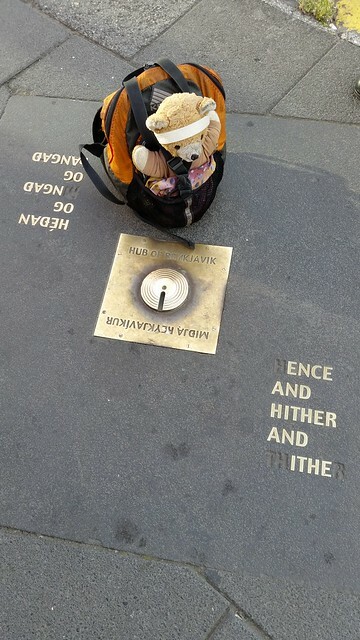 The official center of Reykjavik is at Vesturgata 2, at a plaque from which all other streets in the city are measured. 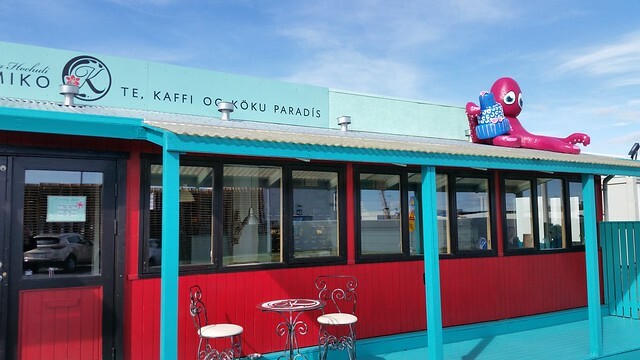 It's also the address of a seafood restaurant that operates a well-advertised seafood buffet dinner that we had previously considered eating; however, after that big lunch we had no interest in a big dinner and instead kept walking. 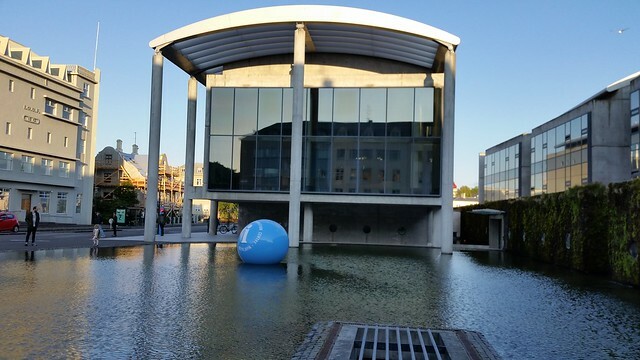 A short walk (the city center isn't that large) took us past the City Hall, where a large blue ball advertised a tourist information center. 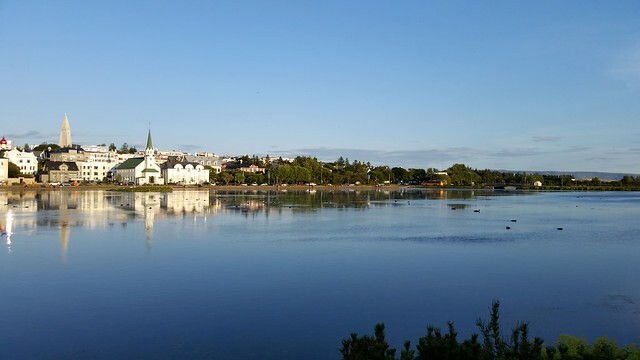 Just past City Hall is The Pond, a large lake in the center of Reykjavik. This made for a pleasant walk and a nice view of the city. 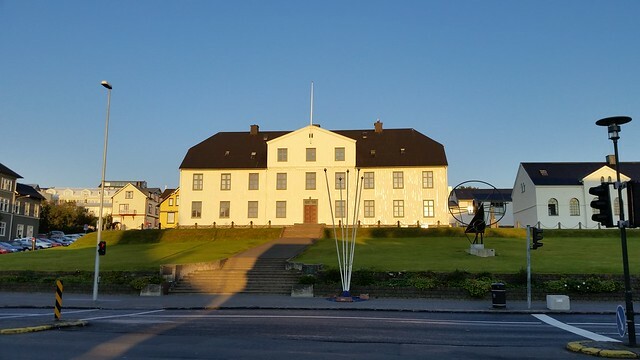 This building looks like it ought to be the parliament, and in fact, the Althing did once meet here long ago, but it is actually the Junior College. 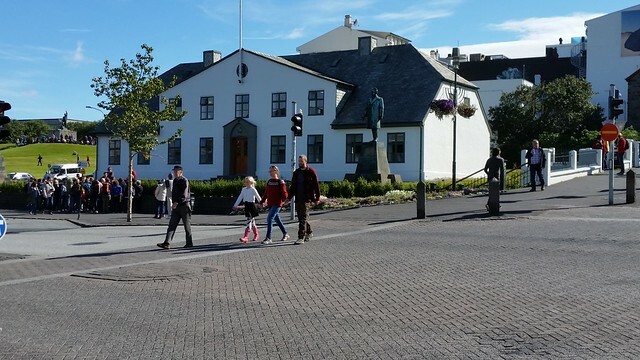 Nearby, at the foot of the main shopping avenue that runs down from Hallgrímskirkja is the Prime Minister's Office — the equivalent of 10 Downing Street in the UK. Unlike the British Prime Minister's residence or the White House, this building is not ringed by security fences and other measures designed to keep people far away. 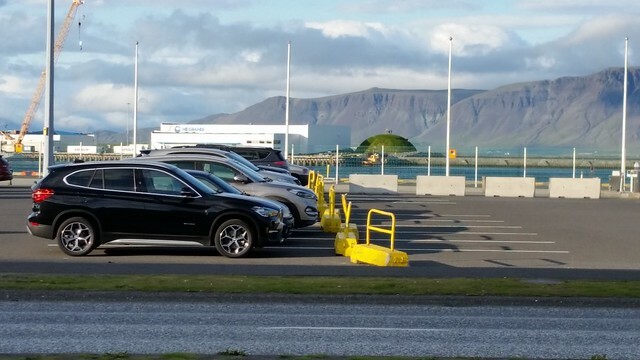 There is a gate to a reserved parking lot, and that's all. It must be nice to not be living in constant fear. Thanks to that huge lunch, Lisa and I were still not terribly hungry come 21:00, so we once again picked up some sandwich stuff and cold drinks (alas for no refrigerator in which to keep them; everything has to be eaten when purchased) for another "picnic dinner" in the hotel room. Tomorrow is our big excursion: our "Golden Circle" tour, one of the must-not-miss parts of a trip to Iceland, or so everyone says. Fortunately we don't have to be up at the crack of dawn, especially given how early dawn is here at 66° North.